It’s not hard to google ‘how to make a crib sheet’ and find some decent tutorials. That’s why I’m sharing this with you. Huh? So anyway, here is a tutorial on how to make a Minky crib sheet. Cuz yeah…minky’s awesome. I would drape myself in minky if I it was socially acceptable. 1. Measure your mattress. Most crib mattresses are 51 x 28 inches, but obviously there will be some variations. So measure. Measure the length and width and then add 8 inches to each side (16 total per side.) So you’d have to cut about a 67 x 44 rectangle. 2. Fold your rectangle in half, then in half again. Find the corner where all the corners meet and measure out a square that is 8″ x 8″. Cut out the square. 3. Unfold your rectangle…you should have a big plus sign. Starting with one (former) corner, put the two 8″ cut sides WRONG sides together. Pin in place. Are they WRONG sides together?? 4. Sew each pinned side together. It should feel like you made a mistake…seeing the seam allowance on the right side of the fabric. Like this! 5. Now clip the seam allowance so it’s no larger than 1/4 inch. 6. Turn your seam inside out, so you are looking at the wrong side of the fabric. Then sew another seam with a 5/8 inch seam allowance. You have created a French seam! This is what it looks like up close. 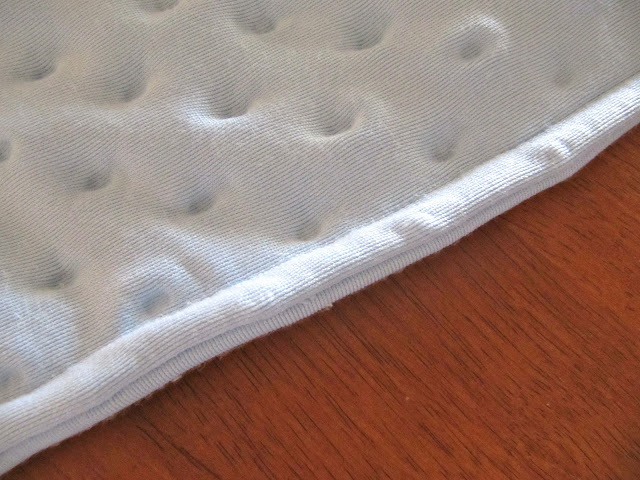 French seams are awesome for crib sheets and the best option for minky. Minky sheds like crazy and no amount of serging will get rid of the shedding completely. Do that to all four corners and you are ready for the elastic casing! 7. Fold about 1 1/2 inch of fabric up to start your casing. 8. Before you start pinning up your casing, fold down about a half inch down. 9. Place pins in every few inches like this. 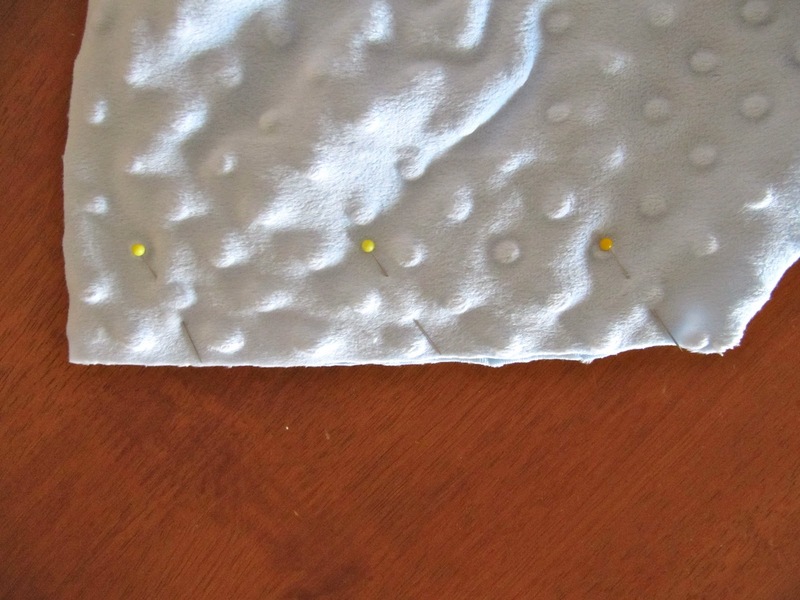 Then start sewing along the edge of your 1/2 inch fold. 10. Sew along the entire edge but leave just a few inches open to put the elastic in. 12. Now the fun part (not really.) You get to guide your elastic through the casing all around the sheet. It will take some serious work, but you can do it! I have faith in you. Try to even the elastic out as you go, and then when you’ve pulled the other end out, even it up so that you have an equal amount of stretch throughout the sheet. Trim your elastic to the appropriate length after you’ve evened it out. Sew the elastic together, making sure they are both lying the same way. Then sew up your opening. Done! It should fit perfectly. I love a 8 inch corner seam. And I love how fuzzy and warm the minky is. Now I need to make one for MY bed! That's the right attitude. Everybody can find out HOW to "make it big in business" or "make a crib sheet" or "build a kitchen table". But not everybody wants to. The list of people who DON'T want to do it, far exceeds those who do. So just keep on keeping on and the rewards (however small!!!!) will follow. I have googled crib sheets BUT….this by far has been the most simple for me to understand. Thanks! Thanks for sharing…I've been sketching out the idea for twin sheets for my 2 yo that loves her minky blanket. This would make a fun present for her 3rd bday in a few months. I tried the joann's brand minky and the bubbles have flattened out a lot. Can you recommend a company.website that has awesome minky? Fabric.com plus soft minky dot LOVE IT!!! Thank you for sharing this tutorial! 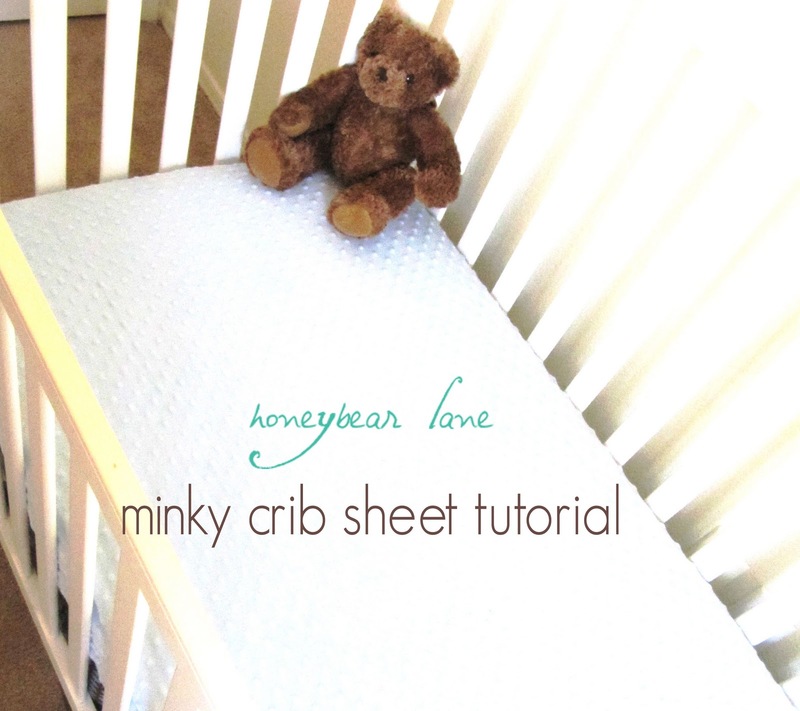 My first thought when I saw the minky crib sheet was, "Ohhhh, I wonder if I could make one for my queen-sized bed?" Ok I LOVE the minky crib sheet. 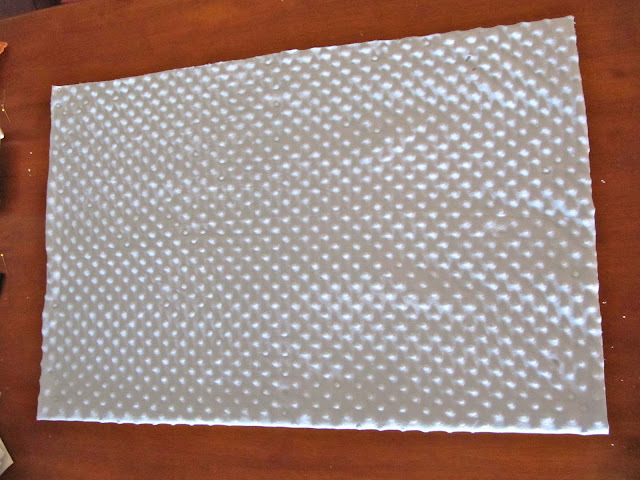 I did a changing pad sheet for my youngest and reupholstered our glider in it. I joked with my step Mom (who assisted in the reupholstering) that I was going to sit in it stark naked! haha because I too would LIVE in minky!!! 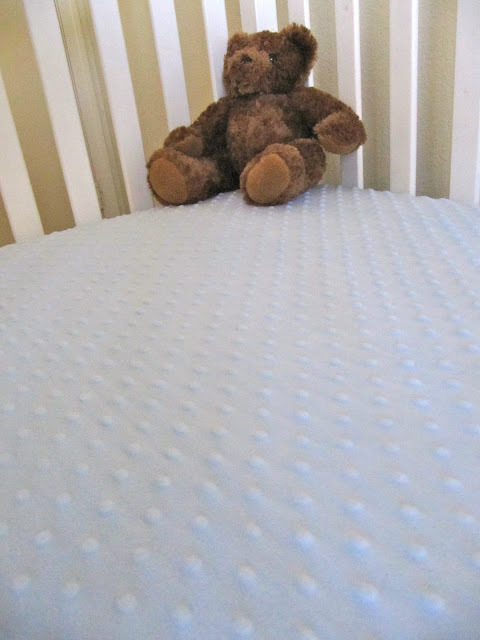 I did flannel crib sheets, but never thought to use minkee. Great tutorial – the pictures really make it easy! I have learned to sew because of blogs like yours. This tutorial is awesome and I am planning on making one really soon as my due date approaches! Thank you so much for this tutorial!!!! Sew cute and simple! Can't wait to find out if this little bean is a boy or girl to test out your tut. Thanks for the clear explanation! Your little one must love it! I also had questions about finding minky where the little bubbles don't flatten and how to sew minky so it doesn't get all bunchy. Just made this and followed directions exactly and sadly it didn't fit my standard size crib mattress. (length fit but width did not 🙁 going back and looking at it it looks like it would need to be about 4-5" wider for my 51×27 mattress). Minky is too expensive to have an oops moment like that! Oh well, Im gonna cut it up and make a couple pillows now! Oh no, so sorry! The minky is usually around 54"-60" wide so if it wasn't that wide I can see how you'd have problems. I always measure the sheet on the mattress after sewing the corners together, before I sew in the elastic. Sometimes things are just off, so you have to tweak until they fit. Another thing you can try is making the corner seams 8' instead of 9" I think that fits the fabric better.) Better luck next time! 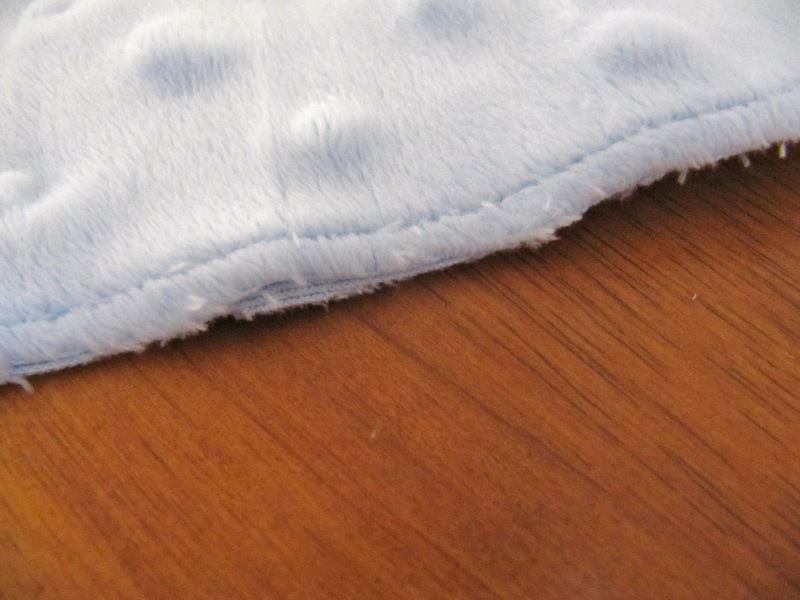 Also the best minky you need to purchase online…try fabric.com or minkydelight.com. You can also get pretty high quality minky at Hobby Lobby (and use a 40% off coupon, yay!) The minky from Joanns is pretty low-quality, so don't waste your money. Thanks so much for the tip,I was determined to have these cute sheets so I went and got some more and with my 60" minky I was able to get it to work with an 8" corner! 60×38. That only accounts for 9" not 18". Would the 60×38 be too small? I did the exact same thing when I was going to make this for a gift–about a year ago…looks like she’s “fixed” her final measurements since then, huh? I had to take mine apart and make a blanket instead. Thank you so much for sharing your knowledge!! I am expecting my first grandbaby in Dec., so my husband bought me a sewing machine for me to learn to make baby things, LOL. I have never used a sewing machine or learned to sew and this was my first project!!! It turned out perfect!!! Now back to the store for more fabric to make one for my house! Thank you!! Hi! You say to cut out an 8×8 square, but your cutting mat shows you cut out 8.5×9…are you adding seam allowance on there? Not sure if it’s quite accurate in the picture but it’s an 8×8 square. Yay!! Loved this tutorial!! Made a perfect turquoise minky crib sheet in just under 90 minutes from tutorial search to completion!! Very easy to follow, and now my little guy has the softest sheet around 🙂 Thanks, Heidi!! You are awesome!! That is a GREAT tutorial. My crib sheet fits PERFECT! Thanks for sharing! I am soooo going to make this for my baby girl! What is the width of your elastic? 1/4 or 1/2? Just made one last night for my little guy!! It turned out perfect! It’s as snug as bug in a rug!!! Thank you so much for wonderful instructions!!!!! So glad it worked out!! Yay! I am a beginner at sewing and this was the perfect tutorial for me. I’m thrilled with how my crib sheet came out. Thank you for sharing your talent with us! Your instructions were perfect!